After 6 years of dating, Jordan and Maddie tied the knot on Jordan’s 100 year old great grandmother’s ranch in Etna, CA. 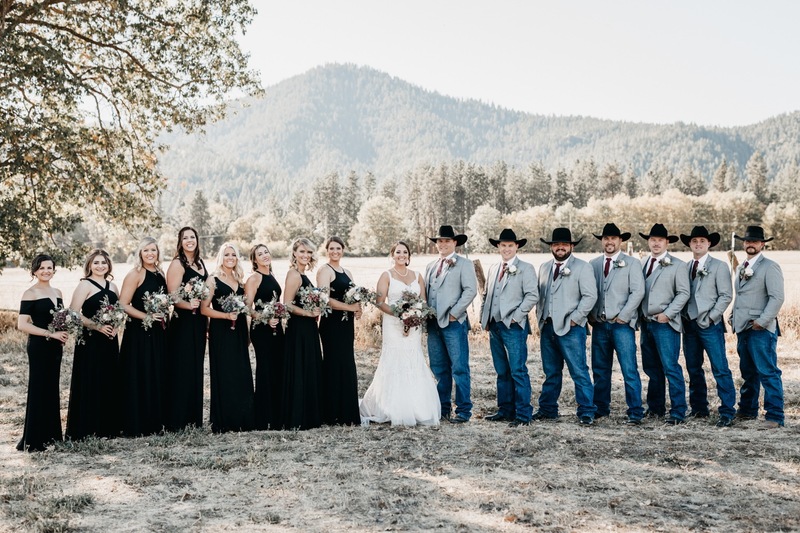 They both grew up in ranching families, so paying homage to their western heritage while throwing one heck of a party was the main priority for their wedding. They wanted the focus to be on the beautiful fall setting, so they kept everything simple while including meaningful touches like Maddie’s leather bouquet wrap that was hand tooled by her grandpa, hand lettered signage done by a close friend, barn wood “runners” from the ranch, cow cake toppers, and touches of pink that were a nod to the bride and her grandmother’s pink wedding dresses. 325 guests watched as Jordan and Maddie were married by a very close friend in a touching ceremony overlooking the beautiful Scott Valley. After dining under the stars by candlelight, the wedding ended with dance party done right! Jordan and Maddie had not one, but two “first dances.” Upon entering the reception they had a traditional slow first dance to “Forever, and Ever Amen,” (a theme they carried out through the decor) and then started the party up again after the formalities were finished by swing dancing to “Unbelievable” by Diamond Rio.